Take it from a guy who owns a couple of dozen RC toys with different RC brands, this habit can run quite expensive if you aren’t well researched. 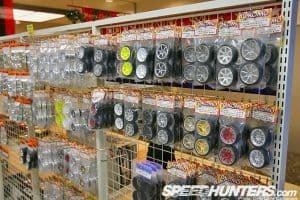 Finding the Best RC Drift Car is no different, they are either electric or nitro-fueled, and their tires are the low grip for easier drifting. Selecting the perfect radio controlled drift car depends on a number of factors. Cost should weigh in at the end, as this is determined by performance, quality, durability, any licenses, and features. Serious racers generally spend more than hobbyists and collectors. There is a great deal of literature on the topic of radio controlled drift car racing, different events, prizes, and most importantly how to get started. 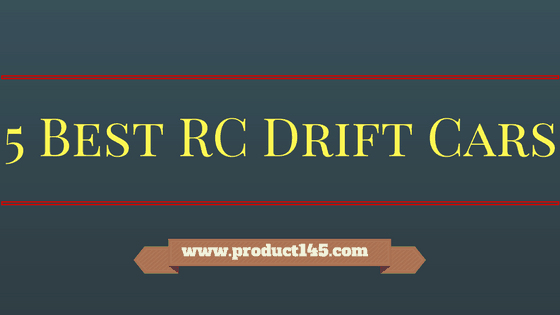 If you would like to know more about it check out our RC Drift Cars Overview and Guide. I have provided a list of electric ready-to-race (RTR) RC drift cars and buyers guide for the beginner to serious hobbyists. It is wise to compare cars, features, and needed or recommended accessories (Continued Cost) before making a purchase. Also, pay attention to any warranties offered for the cars that comes with ready-to-race (RTR) before making any upgrades yourself. Drift Cars categorized in Motor Type,Build, Upgrade options and Price. Redcat Racing EPX Drift Car make some of the best beginners RC cars. They have multiple options for motor,assembled out of box,price points,plenty of satisfied customers and ideal for beginners. It is a battery operated drift rc car, it comes in two body colors metallic blue, metallic red and blue/yellow flames. I would recommend this rc drift car for first timers because its durable, fast and easy handle. It features a vivid poly-carbonate body and forward and reverse transmission. It does come with a battery charger, but other accessories are available for purchase separately. Manufacturers claim the top speed to be ~40 Mph with lipo.However customer have mentioned that if its electric brushed motor the top speed is between ~24-27 Mph and with brushless motor with upgrades they have clocked up to 51 Mph. Below are some of the technical specs and pros and cons of the Redcat Racing EPX Drift Car. Aluminum moving parts,plastic rim and rubber drift tires. Transmitter Range 500ft-600 ft and battery lasts 20 mins. Sturdy chassis, aluminum shocks, ball bearings, etc.. make for durable car. Multiple body color options for right out of the box fun. Easy to learn and user friendly for beginners. Just like any drift rc cars, rims are prone to damage.Suggest getting better Redcat racing rims and proper drift tires. Not many options of upgrading the car, rc kits available but not recommended by manufacturer. Upgrades: Apart from the plastic wheels and tires, you can also add better batteries (make sure they up to are manufacture code). Although the option of gas conversion is possible, its not recommended. I’m a sucker for Exceed RC drift cars, on the low end I own both Exceed RC Electric DriftStar RTR Drift Car and Exceed RC 2.4Ghz MadSpeed Drift King Brushless Edition .But I prefer the MadSpeed Drift King as it comes with the brushless motor, fully assembled and ready to race. Top it off with foam bumper for added protection, oil filled shock, 3KG high torque steering servo, I’ve seen less visible damage and increased performance compared to Drfitstar RTR model. It is a hot looking car with sick metallic dark grey exterior with white decals,spoiler,working side view mirrors and exhaust.Top it with some working lights,blinkers and interior/underside glow lights, it sure gathers attention and fans. Apart from the showman ship ,its actually has a sturdy CNC aluminum upper deck and center drive to absorb any crashes. Since out of box tires are hard plastic I would recommend upgrading the tires. I have clocked mine around 30Mph with street tires, additional batteries,upgraded charger,new shocks and few more tweaks. Below are some of the technical specs with pro’s and con’s for this RC drift car. Durable parts and easy access to front and rear ball differentials. Great looking RC with functioning lights. Really bad drift tires, power to body ratio shreds them. I would recommend a upgrade with tires. Out of box batteries are not so great, I would recommend LIPO’s with them. Upgrades: Plastic wheels and tires, you can also add better batteries (make sure they up to are manufacture code) ,I have adjusted the shocks and had a blast trying out different lights for the interior and underflow lights. Apart from that I love it the way it is! HPI is a respectable company when it comes to RC drift cars. So I was bit torn between Mustang Drift Monster electric model and many other great models they offer. In the end I would choose HPI Subaru Drift for one reason, its simply cool RC drift car! Now apart from the cool looks, here are some of the technical specs along with pros and cons. Heavier base made for drift but you can upgrade it into touring car. Upgrade to brush motor yourself. Discontinued by the manufacturer, hence any upgrades or issues will need to done you (this could be a pro, if you’re a serious hobbyist). I would recommend a upgrade along with 2s Lipo to really feel the car.Need a new tires for road drive. shaft drive transmission: if you’re a serious hobbyist then I would go with long belt drive transmission in the newer models. We’re back to Exceed RC drift car but this time its Team Energy X10DR Belt Drive Pro Drift Car Ready to Run GT3X. This sleek design has low center of gravity and is belt driven chassis built for higher performance and speed.I mean this is another level of speed from you’re lower tier drift cars, achieved because of the belt drive transmission and 3900mAh LIPO batteries. Because of the carbon fiber upper and lower chassis plates, its extremely light weight and helps with precision handling. It also has a oil filled shocks and premium cut pistons to provide bump and shock absorption and body roll control. The suspension is tunable and drive train will help with differential tightness. Here are some of the technical specs with pros and cons. long belt drive transmission – mean higher performance than the regular shaft drive transmission. Versatility, can be modded and tuned into a touring car with not much changes. Price, this is bit on higher side. Mind you, I’m not referring to actual price but if you want to upgrade the car or frame or outer shell. It adds up pretty quickly. Constant tire replacement; because of its speed it shreds tires more often than other drift cars. Exceed RC MadDrift Electric Brushless Limited Edition is a perfect design of elegance and speed. It has a unique centralized low center of gravity design, street ready tires and high strength drift body.Durable oil filled shock and 80A Brushless electronic speed control with 540L 2150KV brushless motor. However, unlike our earlier suggestion this is a slighter bigger scale of 1.8th scale platform on toad car. It has a higher RPM so higher speed drifting. The limited edition features aluminum chassis, aluminum shock towers,aluminum auckermann, aluminum front and read chassis braces to reduce any impacts. The ESC is mounted right in the center of the car and the two batteries on either side of it to create the best possible balance and weight ratio for superb handling. All the features of this car scream performance in a ready to run package. Battery charger and AA batteries not included for the heft price tag. Nitro-fueled cars do initially go faster, but they are heavier, and due to having actual combustion engines, need more repairs and simply do not last long. The electricity powered cars are operated with rechargeable batteries and while the battery life is not as long lasting as nitro fuel, the cars themselves last longer. There are quick chargers that can make for actual quick pit-stops for the cars, but batteries today actually last for several more hours than batteries of just a few years ago. For the beginner who is just exploring an interest in radio controlled drift car racing, it is probably better to go with one of the less expensive models we mentioned above, and then build up to the more expensive as interest grows. Remember, there are ready-to-run kits as well as ready to build car kits. In addition to both the ready-to-run and ready to build kits, there are accessories that can really make drift cars stand out. Some racers don’t care as much for the aesthetics, the appearance of the car, as they do mechanics, while there are some that want their drift racing cars to appear like an actual drift racing car down to the most minute detail. 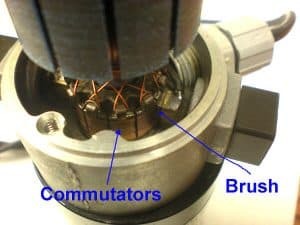 Not gonna lie, as a hobbyist I knew brushless motor was superior compared to brushed motor but couldn’t give you a proper scientific reason.Hopefully this simplistic explanation from Quantum Devices Inc will help clear out your doubts. Brushes inside electric motors are used to deliver current to the motor windings through commutator contacts. Brushless motors have none of these current carrying commutators. The field inside a brushless motor is switched via an amplifier triggered by a commutating device, such as an optical encoder. 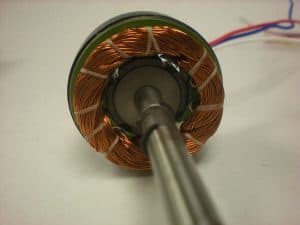 Windings are on the rotor (Rotating part of motor) for brush motors and on the stator (stationary part of motor) for brushless motors.By positioning the windings on the outside stationary portion of the Electric motor the need for brushes can be eliminated. 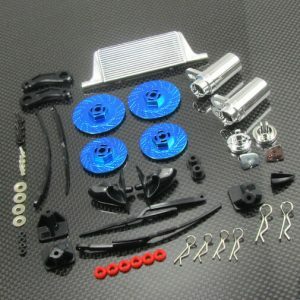 Beginners and cheaper RC cars are usually equipped with brushed motors. Because of the structural advantage its less expensive,noisy and less efficient. Their lifespan is lower because of the wear and tear of the brushes. Because of the efficiency, it produces more power and is slightly more expensive. Any serious RC hobbyist would upgrade to one eventually. Their life span is higher because of no maintenance cost (brush replacement and wear and tear). The inner workings of the car cannot be stressed enough. While the brushless motor does run into quite a bit more money, it is the chosen motor of serious racers. 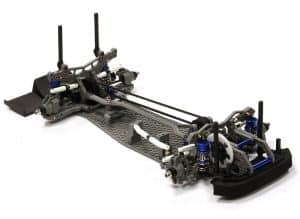 Additionally, even though the lighter cars may have more speed, the frame of the radio controlled drift car should be heavier, rather than lighter. As with real cars, obviously, the quality of tires is important, and the best drift racing cars are four-wheel drive. LIPO: They are cheap,powerful,light and can be reused several time a day but they have tendency to burst into flames if over charged.Use caution and follow instructions when using them. NiMH: They can be used couple of time a day and are powerful but they are heavy and take forever to charge. NiCad: They are cheap and durable but they lack power and are heavy. 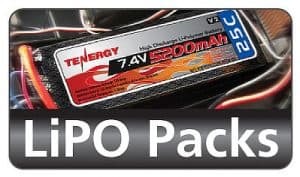 Personally, LIPO is my go to batteries and they are becoming industry standard for all RC cars. 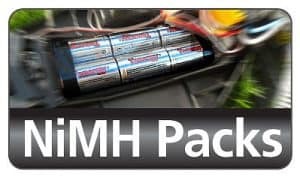 If you don’t want to shell out $50 for four pack batteries. I would recommend you buy a package deal as a beginner. Since you’re interested in drift RC cars, its crucial you pick the car’s motors that generate high torque steer.Coupled with slick low tires, the RC car will be drifting with no issues (of course there are other aspects that play in as well). So, how does belt vs. drive shaft play into picture?! Belt shaft driven gives you less friction, better rollin and is more stable, more stability means more control on the drifts. For competition I would choose belt drive. Shaft drives are usually more efficient. But many people say they have torque steer. But because of the power transfer, they might not be the best option for high powered motors. The available accessories range from fancy light kits to spoilers, or specialized decals. For those more interested in the mechanics, there are also add-on kits to enhance the drifting ability of the cars, such as improved rear differential and suspension. Those who are skilled in auto mechanics as a trade or a hobby can do wonders with their radio controlled drift racing cars. 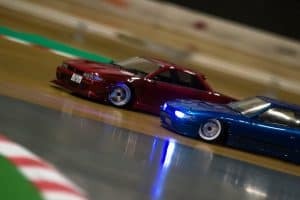 Hobbyists and enthusiasts should know that when purchasing a radio controlled drift racing car, the same features should be desired as if looking for a real life drift racer. Things to look for are a polycarbonate body, it is sleeker enhances maneuverability and speed; quality adjustable shocks- shocks tend to wear out quickly if this item is skimped on; and while it is great to have an eye-catching design, for drift racing the design needs to also be sleek to make taking those corners easier. Additionally, the car, just like a real life car, is going to run only as well as the quality of the chassis, which for optimum endurance the grade of plastic needs to be of the highest quality. However, whenever possible opt for metal or aluminum parts for longer lasting life and durability. The best thing to remember when investing in a radio controlled drift racing car is that “you get what you pay for”. Money well spent in the beginning can save on repairs and/or replacements later on. For the new buyer or racer, spend some time with other racers or in an actual store before going to the web to purchase. While yes, generally online prices are lower, and many with free shipping, some with no tax, it is best to get a literal feel of the product and get an up-close look at the detail. Reading about a product and seeing and touching it are two different things. Joining a Facebook community or Meetup is also a good way to get into the exciting arena of radio controlled drift car racing. Be advised, that like regular automobiles, and especially racing cars, these cars require maintenance. There are accessories available to improve performance and appearance. All of this can run into quite a bit of money. That is probably the best reason to get the car you want at the very beginning. Most cars are $100 -$200, making the choice between an extra $20-$50 not such an important factor. That being said, Enjoy and welcome to the world of RC Drift Cars! !